First author’s institution: Division of Geological and Planetary Sciences, Caltech. As an astronomer—who can only study the radiation from distant extrasolar objects—I’m continuously amazed by the diversity (and quantity!) of data when I delve into a paper about a Solar System object that we’ve actually visited. 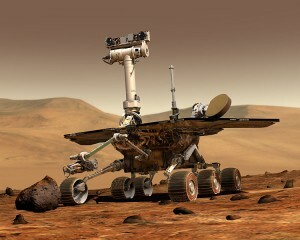 An artist's conception of the rover Opportunity, which discovered the sedimentary rocks that provide evidence for water on Mars. Image credit NASA/JPL. Take this paper about Mars. The authors start from discoveries from the Mars rover Opportunity, which found evidence for liquid water on early Mars by analyzing rocks. Opportunity found certain kinds of sedimentary rocks; by analyzing their structures carefully, we’ve determined that these rocks could only have been formed if liquid water were present in early Martian history (between 1.8 and 3.5 billion years ago). However, water can’t be liquid on Mars in rivers and oceans as it is on Earth; it’s just too cold. Going back in time (when Mars had a thicker atmosphere, and thus a stronger greenhouse effect) turns out not to help our cause enough. The Sun was significantly fainter billions of years ago, and would not have raised the mean temperature of Mars enough to support permanent bodies of liquid water at the times needed to form these rocks. These authors suggest that seasonal snowmelt might instead provide the water necessary. The orbit of Mars has changed significantly in cycles over the last 5 billion years. Much like the Earth, Milankovitch cycles from orbital forcing in the Solar System cause the ovalness (eccentricity), tilt (obliquity), and alignment of the orbit (due to precession) to change. In fact, because of the placement of Mars in the Solar System, the Martian orbital parameters are somewhat chaotic and the obliquity and eccentricity of Mars have varied significantly more than Earth’s in the past 5 billion years (see Laskar et al. 2004). What do these large variations in orbital parameters mean for the climate of Mars? One of the biggest changes is the location of ice; currently the ice on Mars resides in ice caps at the poles (as on Earth). However, if the rotation axis of Mars was once highly tilted (greater than about 40 degrees), the ice at the poles would no longer be stable; it would actually sublimate into the atmosphere. Counterintuitively, at these high obliquity angles, the ice actually forms most stably around the equator. How do we get liquid water? To create these sedimentary rocks, we need actual liquid water, not solid or vapor. The surface temperature at the ice must exceed 0 degrees C (273 K) to melt it. The authors of this paper have built a model to determine when exactly this situation occurs, for all probable orbital parameters predicted by dynamics models. The obliquity must be high (>40 degrees), so that the ice is stable at the equator prior to melting. The eccentricity must be moderate (e>0.12). The perihelion (closest approach) of the orbit must coincide with the a high noon-time Sun at the equator (equivalently, the Martian spring or fall equinox). If these conditions are satisfied, liquid water can melt on the surface. This “snowmelt” can deposit material, over time forming sedimentary rocks. Order of magnitude calculations show that this process could create a significant enough layer to explain the rover observations. Regions where snowmelt will occur, for a given set of orbital parameters (obliquity of 50 degrees, eccentricity of 0.145). Melt is predicted to occur in the regions shaded red and yellow (Figure 12 from Kite et al. 2012). There’s not currently enough evidence to prove that this snowmelt hypothesis is correct; however, that will change with the Mars Science Laboratory which launched last Thanksgiving (and will land on Mars this summer!). Based on their models, the authors provide half a dozen testable predictions for the Mars Science Laboratory at the Gale Crater, where this snowmelt process is predicted to be important. If the predictions match the new observations, this model will give us insight into the global climate characteristics of early Mars, including its potential habitability! How much do we know about the sorting of sediments in Gale crater /elsewwhere and how deep do they expect to drill there ?